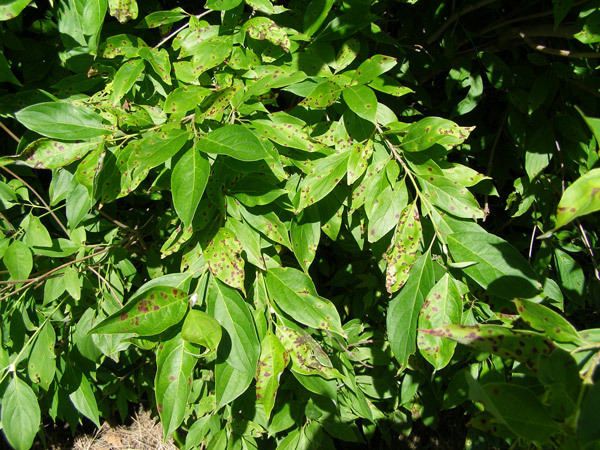 Leaf spot diseases weaken trees and shrubs by interrupting photosynthesis. Most leaf spot diseases affect only a small percentage of the tree's overall leaf area, and are a minor stress on the health of the tree. Leaf spot diseases should be taken seriously if they result in moderate to complete leaf loss two to four years in a row. Leaf loss during several consecutive growing seasons can result in reduced growth and increased susceptibility to pests and other diseases. There are many leaf spot diseases that occur on a wide range of native and ornamental trees and shrubs. Many leaf spot diseases have similar biology and therefore very similar management options. 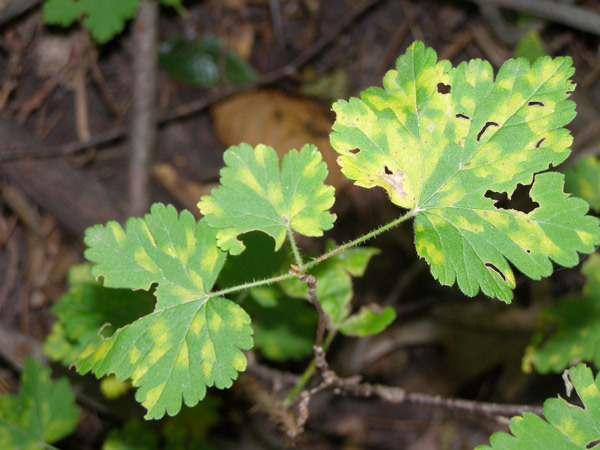 Information about some of these diseases is included below along with management information applicable to all leaf spot diseases of shade trees and shrubs. 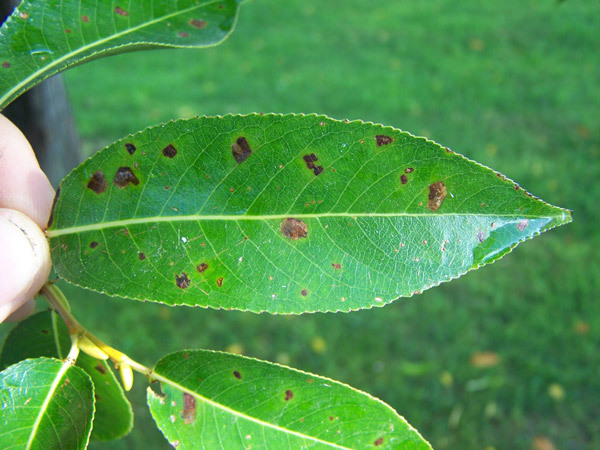 Leaf spot diseases will not seriously harm your plants, but there are things you can do that, when done together, can reduce the disease on the tree in following years. Rake up and destroy fallen leaves before the first snowfall to eliminate locations where diseases can survive to re-infect the plant the following growing season. Do not overcrowd plants — use size at maturity as a spacing guide when planting. Prune trees or shrubs to increase light penetration and improve air circulation throughout the canopy. Wet conditions promote disease, so water trees at the base and be careful not to splash water on leaves. A drip or soaker hose works best for this. Avoid sprinklers. Water your tree throughout the growing season so that the top 6 to 8 inches of the soil is moist, especially during dry summer periods. Soil should be allowed to dry before watering again. Maintain a 3- to 4-inch-deep layer of mulch around your tree. Do not mound the mulch around the trunk of the tree but lay a flat layer with at least a 2-inch space between the mulch and stem to allow for air movement. Annually reapply mulch and inspect to ensure levels are maintained. Do not fertilize trees and shrubs suffering from leaf spot diseases, unless it is recommended by a soil test to correct a nutrient deficiency. Fungicides are not necessary unless a tree has lost all of its leaves several years in a row. Proper timing of fungicide applications can vary depending on the biology of the disease. High-pressure spraying equipment is needed in order to get complete coverage of the canopy of large trees. Hire a professional arborist to treat leaf spot diseases in large trees. The majority of leaf spot diseases are caused by fungi, but a few diseases are caused by bacteria or other pathogens. Many pathogens are somewhat host-specific and will only cause disease on trees in the same family. Almost all trees and shrubs are susceptible to one or more leaf spot diseases. Leaf spots come in a wide variety of shapes, sizes and colors. Leaf spot diseases usually are seen first on the lower and inner branches where humidity is higher and leaves are shaded. 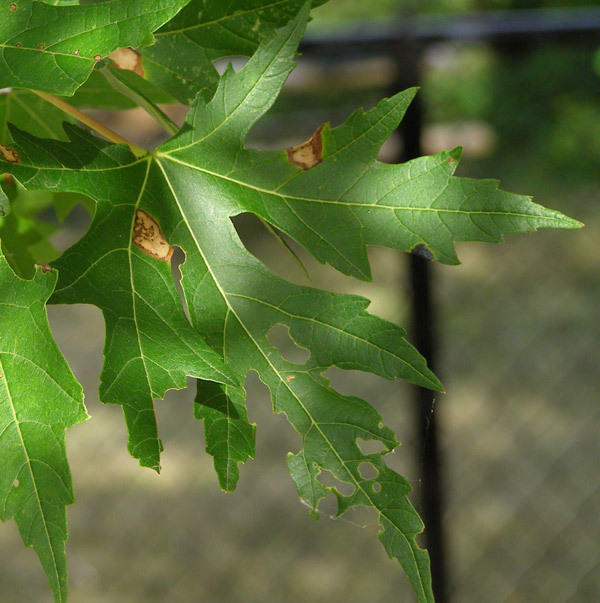 Spots occur randomly on the leaf surface because the pathogens that cause leaf spots are blown there by wind or splashed by rain or irrigation. 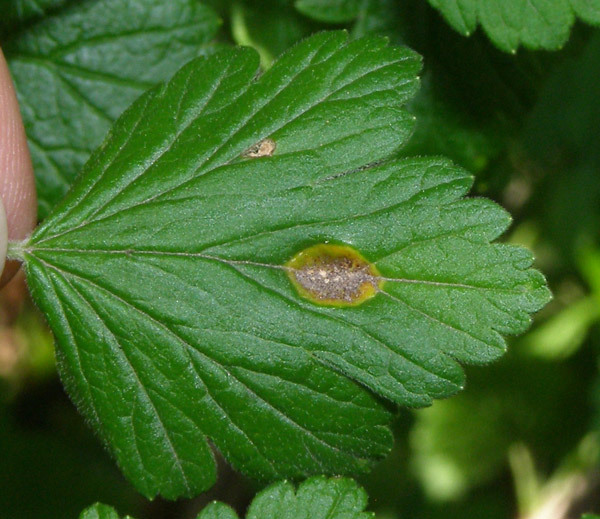 Depending upon the pathogen, leaf spots may occur on the upper, lower or both surfaces of the leaves. Leaf spots may be angular or rounded, raised or sunken, and have smooth or fringed edges. Colors can range from yellow to yellow-green to orange-red to light tan, brown or black. A variety of sizes of leaf spots may be observed on one plant. 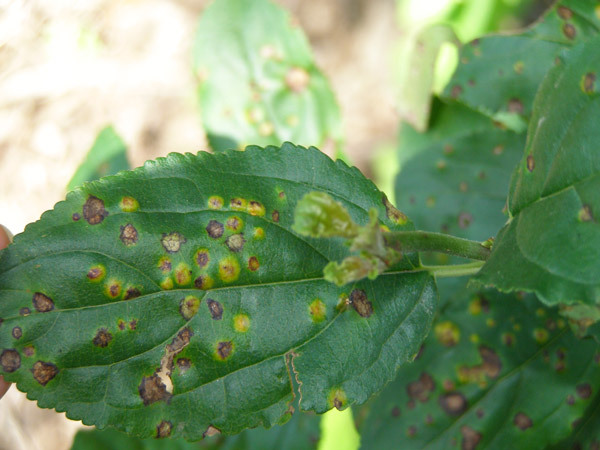 Smaller leaf spots are younger infections. 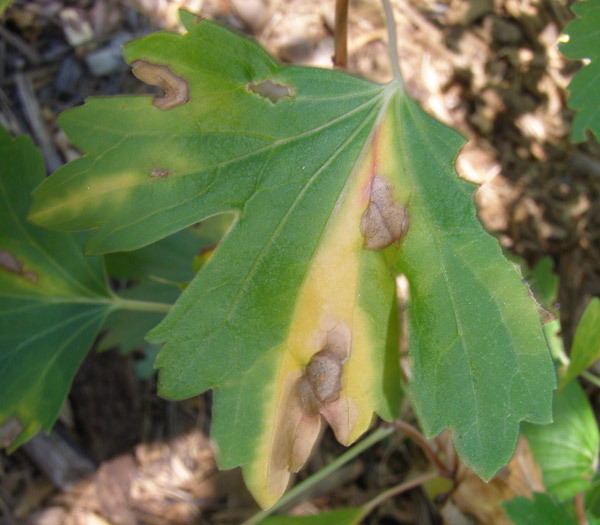 Larger leaf spots are older infections. At the center of larger leaf spots, it is possible to see signs of the pathogen such as fungal spores or spore-producing structures. 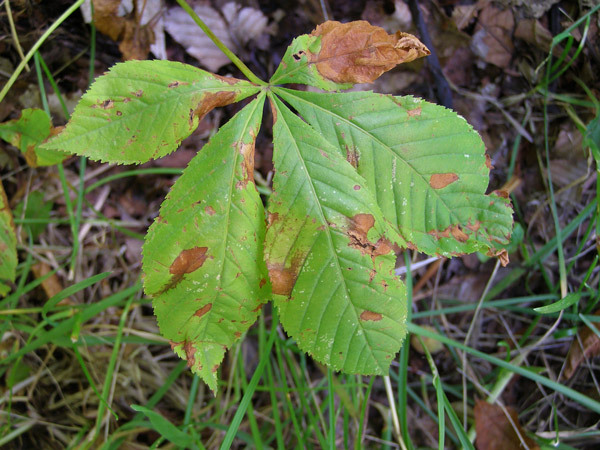 Some leaf spot pathogens cause leaves to drop prematurely, resulting in the tree or shrub losing most or all of its leaves. 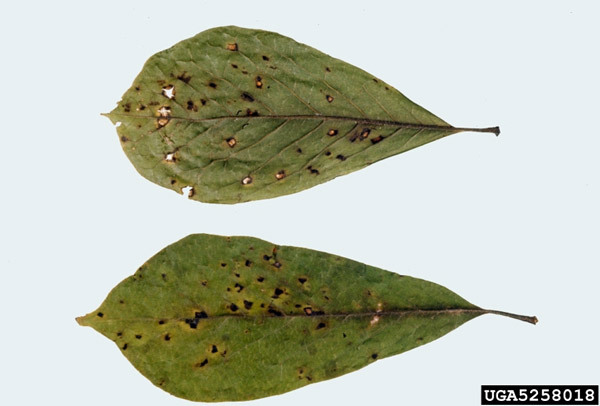 The pathogens that cause leaf spot diseases can survive winter in infected leaf debris. Some also infect buds and young twigs. During the growing season, wind and splashing rain carry spores of the pathogen to susceptible plant tissue and spread the disease throughout the canopy. Most leaf spot diseases need either water on the leaves or very high humidity for a prolonged period of time (12 to 24 hours) to start an infection. Leaf spots often mature in one to two weeks. Mature leaf spots produce spores or bacteria that can be spread throughout the canopy, which can start a second set of leaf spots or cause new infections on other plants. This cycle of infection and spore production repeats whenever weather conditions are favorable. 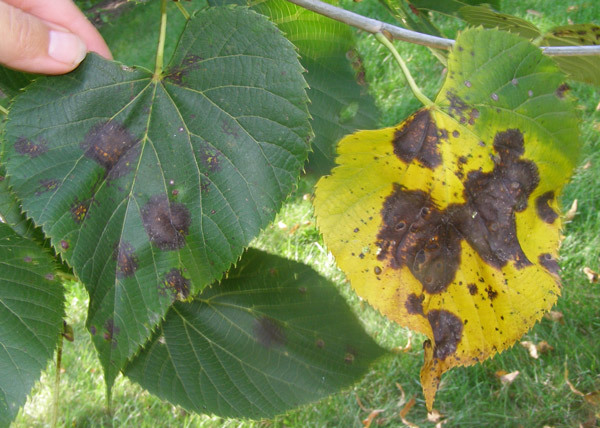 In years with very high humidity or frequent rain events, leaf spot pathogens can spread throughout a tree or shrub's canopy resulting in severe disease. Many leaf spot pathogens are only able to produce symptoms in leaf tissue. 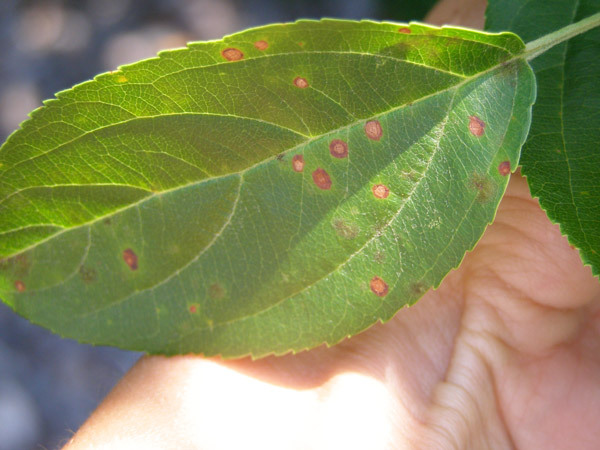 But some leaf spot pathogens can also cause blight or cankers of twigs. Blight is a progressive dieback of young, green shoots. 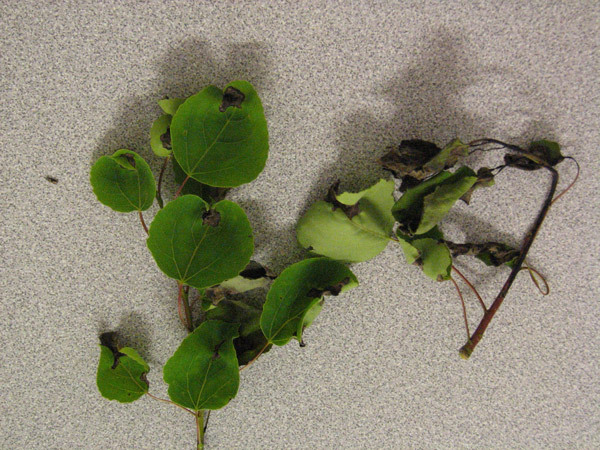 Leaf spot pathogens that cause dieback of young shoots typically do not progress to infect the older woody branches. 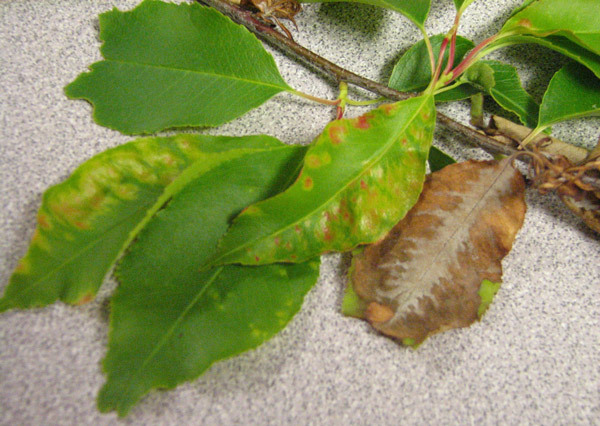 Examples of leaf spot diseases that progress to leaf and shoot blight include Aschochyta blight on lilac and Venturia shoot blight on Populus species such as poplar, aspen and cottonwood trees. 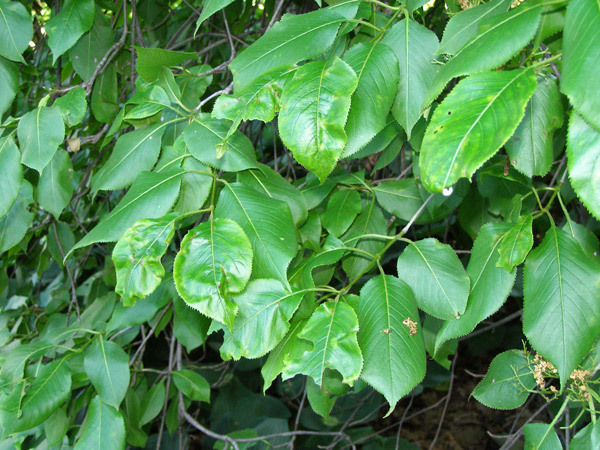 Cankers are infections of shoots and branches that start as round to oval discolored areas where the bark has been killed. As the infection progresses cankers girdle the stem resulting in wilt and death of any leaves above the canker. Branches infected with canker causing fungi often have discolored bark that may be cracked or oozing gums or dark-colored sap. Spore-producing structures often emerge along the margins or on the face of the cankered area. 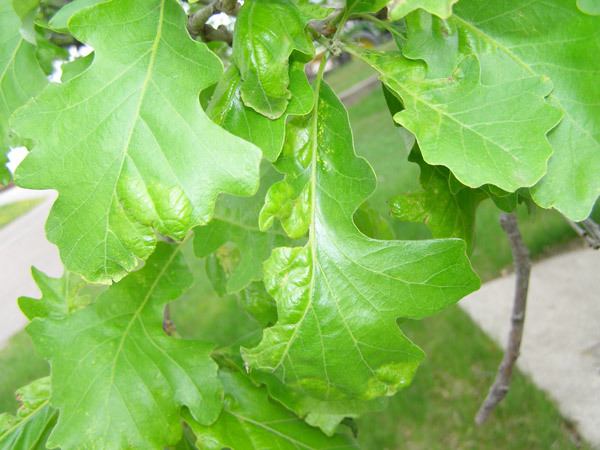 Examples of diseases that result in both leaf spots and cankers in Minnesota include Septoria leaf spot and canker of poplar and Septoria leaf spot and canker of dogwood. See the practices listed in the management section above. Trees and shrubs should be carefully scouted for discolored areas of bark. Any infected branches or shoots should be pruned out several inches below visible signs of the infection. Infected branches should be burned or buried. Bright yellow, orange or red leaf spots. Leaf spots can produce yellow, orange, red or brown powdery spores that can be easily rubbed off and seen on a tissue or paper towel. Spores may be in little blisters within leaf spots or may emerge from tiny cups or tubes on the lower surface of the leaf. 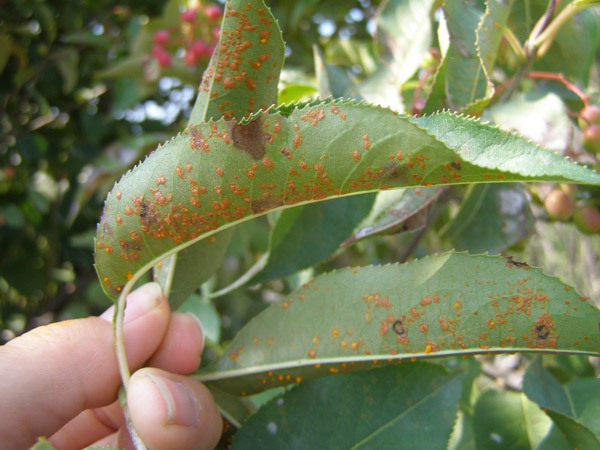 In some hosts, leaf rust fungi also infect petioles, young green stems and fruit. 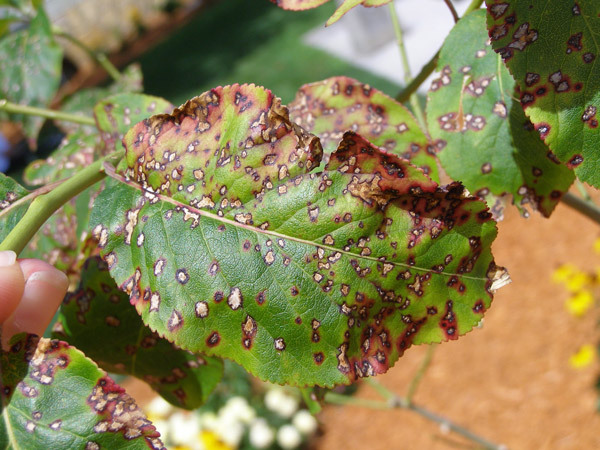 In Minnesota, leaf rust diseases are found on rose, currants and gooseberry, arrowwood or cranberry bush, apple and crabapple, ash, hawthorn and many other deciduous trees and shrubs. Leaf rust diseases are caused by a group of related fungi. Some rust fungi only need to infect one host plant to complete its lifecycle. Other rust fungi require two different host plants. 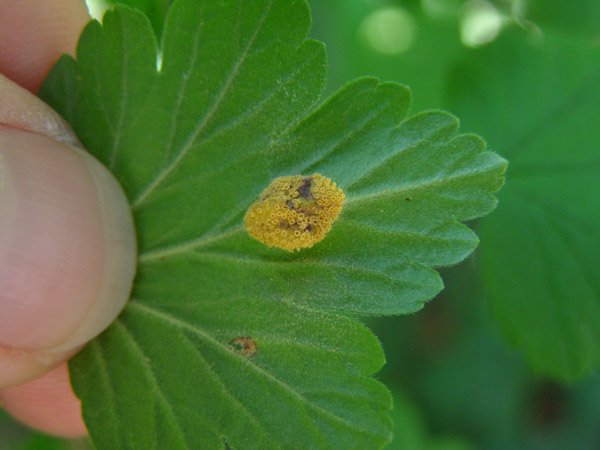 The most common examples of rust fungi that require two hosts in Minnesota are cedar apple rust and other rusts caused by the Gymnosporangium fungus. These rusts infect plants in the Rosaceae family (e.g., roses and apple trees) and also infect species of juniper. Spores of rust fungi can be blown long distances and rust fungi need long periods when leaves remain wet to start an infection. See the general management practices listed above. Plant rust resistant varieties available for certain trees and shrubs. Don't plant two different plants that are susceptible to the same rust fungus close to each other. Downy mildew infections are first noticeable as light green spots on the upper side of the leaf that turn brown with time. Downy clumps of delicate white filaments and spores form on the undersides of leaves during humid weather. If the leaves are infected when young, they may become distorted. In Minnesota, downy mildew can be seen on grape, rose, currants, gooseberry, arrowwood, cranberry bush and hackberry. Downy mildew is caused by water molds or Oomycetes, which are related to algae. On trees and shrubs, downy mildew is often caused by the water molds, Peronospora spp. or Plasmopara spp. Water molds thrive in wet conditions and can be very problematic in rainy years. Downy mildew is rarely a problem in hot dry weather. See the general practices listed in the management section above. 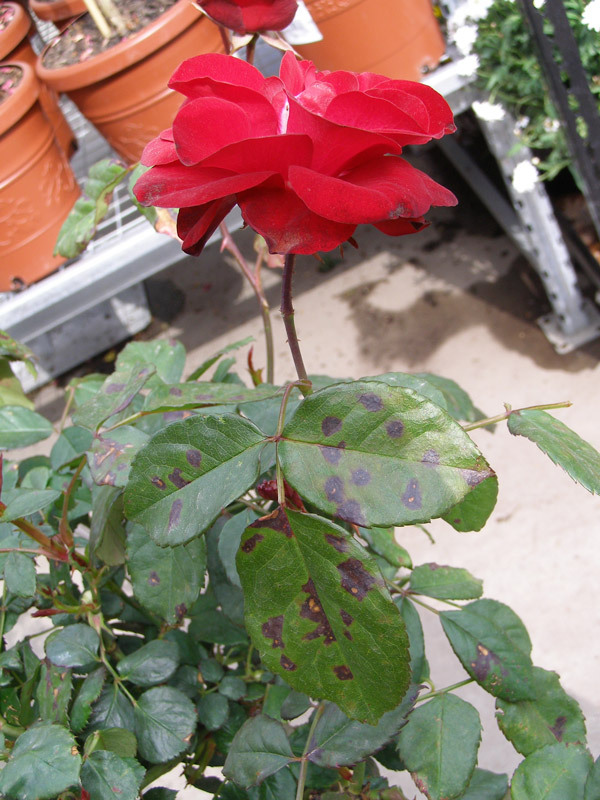 Most fungicides available to home gardeners are not effective against downy mildew pathogens. Bacterial leaf spot diseases often start as small dark brown to black spots with a halo of yellow tissue surrounding each spot. In some cases, the center of the leaf spot will dry up and fall out, giving the leaf a "shot hole" appearance. 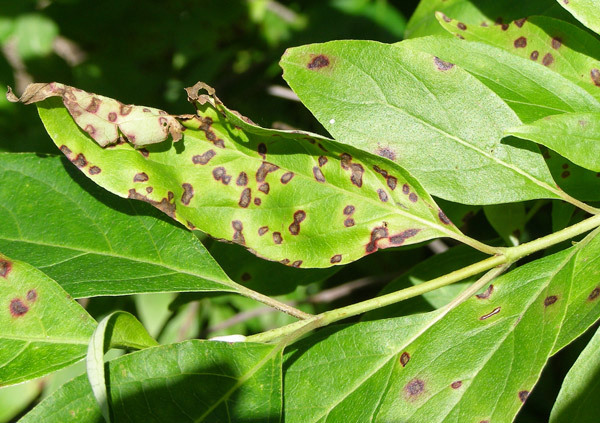 If weather conditions remain favorable for disease, some bacterial leaf spots will grow together creating large black blotches on leaves or turning leaves completely black. 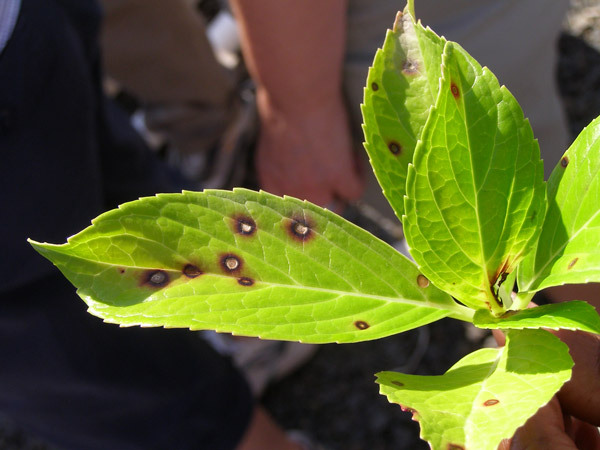 Shoots, buds and flowers can also become black and blighted by bacterial leaf spot pathogens. 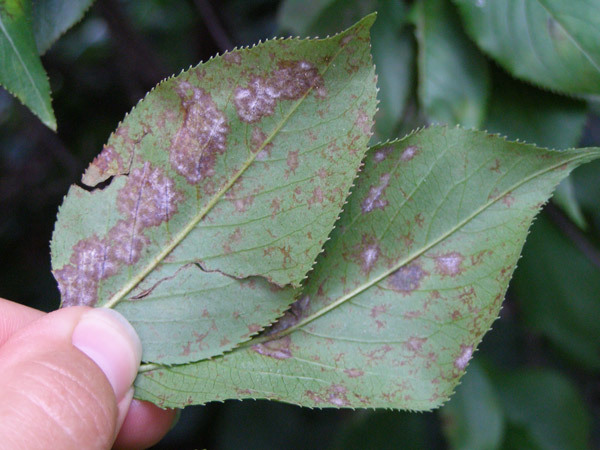 Bacterial blight of lilac is a common bacterial disease in Minnesota. 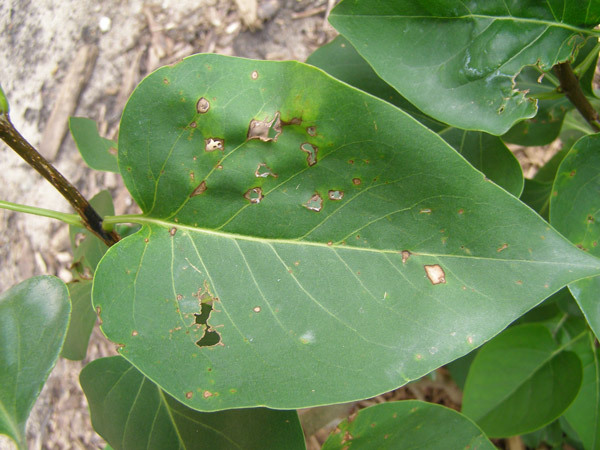 Bacterial leaf spot diseases are most commonly caused by Pseudomonas spp. or Xanthomonas spp. Bacterial plant pathogens often live on plant surfaces in low numbers without causing immediate symptoms. They can travel long distances on moist air currents or be moved short distances on splashing rain and irrigation. When weather conditions are right, pathogen populations grow dramatically and cause disease. Most fungicide sprays will not protect the tree or shrub from a bacterial pathogen. Only sprays with copper or streptomycin as an active ingredient are effective in preventing bacterial diseases.